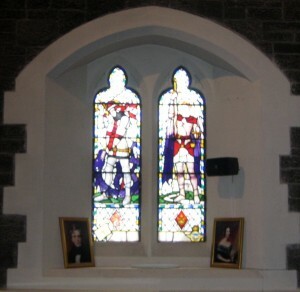 This window depicts St. George slaying the dragon and in the right hand light St. Michael to whom the Church is dedicated. The window bears the inscription:- “To the Glory of God, and in loving memory of Mervyn John Ryan, R.A.F. Coastal Command, who died in the service of his country,12th July, 1943, aged 21 years.” Given by his Aunt Bessie, 1947.